Yes!! On july 10th at 7:30, I’ll be playing drums as part of the house band for these two amazing artists. It’s going to be a night to remember. On top of this great show, both Kevin and Kara have agreed to perform at a private after party for the first 150 ticket holders who RSVP to info@osegllc.com. This after party event will be less then 10 miles away from the MIM (location given with RSVP and proof of ticket purchase via email). 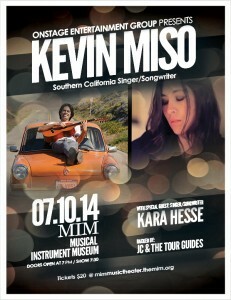 Go to Kevin Miso & Kara Hesse LIVE!!!! at The MIM now to purchase your tickets and be a part of this special night. P.S. Kenny Passarelli, famed bassist for Elton John, Hall & Oats, Joe Walsh and Barnstorm, Stephen Stills as well as Co-producer of Kevin’s new single, Zombie will be joining the show. Joe was born in New York State and moved to The Big Apple after graduating college with a music performance degree. During the early years of Joe’s career in NYC, he performed in various groups with some of the best jazz musicians in the world. He has performed with bassist Ben Wolfe, trumpeter Joe Magnarelli, saxophonist Jerry Weldon, trumpeter Tom Harrell and pianist Joel Weiskopf to name a few. When not touring, Harry Connick Jr. and musicians from his band would sit in with Joe’s jazz quartet. In addition to Joe’s jazz chops, he is an accomplished rock, blues, funk and pop drummer who spent many years recording and touring the east coast music scene and regularly performed at national festivals. In 2004, Joe left NY for the southwest in search of warmer weather, new industry connections and more opportunities to tour and record. His pocket groove, stylistic approach and the depth & breadth of his musical knowledge, was greeted with open arms. Joe stays busy with a heavy regional live performance schedule, touring to other parts of the country, recording drum/percussion tracks for various artists and giving back through his clinics. In addition to his time spent behind the kit, Joe runs JC Productions, which books music for a variety of venues and bands. When in Arizona, Joe often performs with well-known organist Papa John DeFrancesco. Joe has also performed with Joey DeFrancesco, Johnny DeFrancesco and Francine Reed. "Joe Costello", "Kenny Passarelli", Concert, Kara Hesse, Kevin Miso, Musical Instrument Museum, OSEGLLC Concert Series, The MIM, Zombie. Bookmark.